For all the talk about negotiating a reasonable Brexit deal with the EU, not much negotiating has happened almost 2 1/2 years on from the EU referendum in which a majority of UK voters informed the government to make preparations to leave the European Union. Any Brexit negotiations have taken one of two forms; Theresa May endlessly negotiating with her own party over the terms, or the Europeans saying a polite but firm ‘No’ to any proposals put forward by the UK Prime Minister. And when we look at the results of Theresa’s well-intentioned attempts to obtain a Brexit deal, we see the results have been disappointing. Although as we near the official Brexit date of March 29, 2019 it’s likely to change for the better. Assuming responsible leaders on both sides of the English Channel, each month from September 2018 onward should see increasingly frantic negotiations culminating in a reasonable Brexit deal for both sides. Even if some sectors of the economy are left off the table until later in the year, responsible negotiators will guarantee that EU cars can continue to be sold in Britain and that UK services can continue to be sold on the continent without punishing tariffs or other trade barriers on either side of the Channel. If May, Merkel, Macron, etc., can’t meet that low definition of success, the lot of them should be thrown from power at the next election and never be returned to political office as that failure would represent the worst-yet political failure of the 21st century. Only in ‘low ambition Europe’ could such a thing occur. Nowhere else in the world could politicians set such a low bar… and then fail to meet even that (low) challenge. 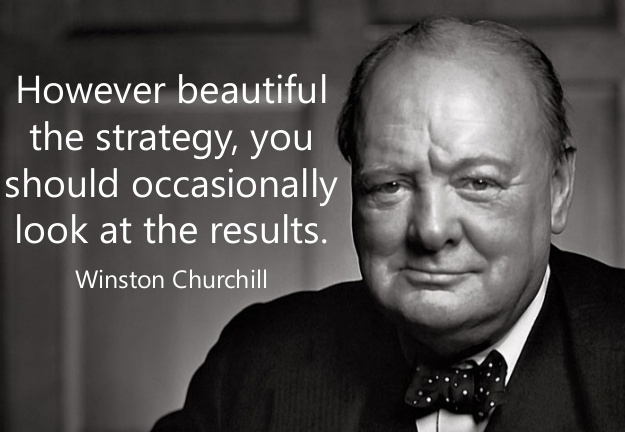 Again calling on the wisdom of Winston Churchill who said, “However beautiful the strategy, you should occasionally look at the results,” we see the results of Theresa May’s negotiating strategy — which has consisted of Theresa negotiating with her party, the government opposition benches, and various lobby groups (some of dubious credentials) and highly placed individuals who work directly or indirectly for HM government. While it can appear that the Prime Minister has done everything ‘right’ it can sometimes occur that you can do everything ‘right’ and still fail. It’s time to try a new strategy to get the Europeans to the negotiating table — but that doesn’t mean dropping the truly excellent speeches, the traipsing around Europe to discuss Brexit with EU leaders, nor does it mean ending the quiet but competent diplomacy that’s been a hallmark of Theresa May’s premiership. What it means is adding a new strategy to the existing strategy, henceforth a ‘two-track’ plan designed to cause EU leaders to run (not walk) to the table to begin earnest ‘Win-Win’ discussions on the matter of Brexit. Some might counter that ‘courage’ has no place in delicate discussions, that diplomacy is always a ‘risk little/gain little’ proposition. But it’s only that if you make it that. Full stop. The Americans didn’t win the Cold War using the ‘risk little/gain little’ diplomatic modality, the Americans ended the Cold War soon after President Reagan employed political courage in America’s negotiations with the Soviet Union by announcing the vastly expensive Strategic Defense Initiative (SDI) that would’ve been prohibitively costly for the Soviets to match and counter. So costly in fact, it would have bankrupted the former Soviet Union to meet the perceived threat of SDI. In reality, SDI was nothing more than a policy wonk’s vision. Thankfully, SDI never saw the light of day. The one thing that we must note is that President Reagan’s team didn’t end the polite diplomatic rapport with the Soviets during that tense period — on the contrary, they ramped-up their diplomatic efforts as never before and employed political courage (courtesy of the SDI gambit) to achieve the results they wanted all along. What Theresa May needs to do now is to employ a gambit, a play to make EU leaders actually see value in a reasonable Brexit deal, a device designed from its inception to guarantee a ‘Win-Win’ result for both sides. If it isn’t seen as a ‘Win-Win’ from both sides, there’s no point in employing it for it will surely fail. Therefore, whatever frustration May must be feeling with EU leaders, now is the time to drop it and move forward with a two-track plan; One; get the EU to the table, Two; continue with the excellent diplomacy she’s employed until now. Using the same sort of gambit that President Reagan employed so well to help end the Cold War, Theresa May should likewise (and very diplomatically) create a gambit that results in the EU seeing the value of signing a Brexit accord well in advance of March 29, 2019. At present, the UK sources 30.35% of its total food demand from the EU (ONS statistics) but other jurisdictions want to purchase EU produce and meats too, so let them! That 30.35% stat has been falling in recent years anyway. Starting September 2018, Theresa May’s government could legislate that the UK must buy 1/5th less food from the EU per month. That sounds like a lot of effort might be required, but during WWII (over a period of a few months) a much larger scale of change was forced on Great Britain, and the United States and The Commonwealth of Nations stepped in to supply Britain with everything it formerly purchased from the continent (not only food, but everything!) and it worked. Let’s assume that after 6-months of zero progress in Brexit negotiations the UK would no longer be buying any produce from the EU, therefore why would anyone spend one moment worrying about EU *food tariffs* or *non-tariff trade barriers* when food is no longer being imported from the EU? Yes, British farmers would lose the ability to export their produce to the EU. But as EU exports to the UK drop, UK farmers will simply sell more produce to UK customers. Nothing will change for British farmers except the destination of their goods. But at any time within the 6-month period the EU could agree a Brexit deal and stop the decrease in EU food exports to the UK. Some crops may need to be sourced elsewhere. Again, the United States agricultural belt is so massive it could supply the UK with 100% of its food needs without a problem. Canada too, has enough arable land to supply 100% of UK food needs — although the country doesn’t have the same labour capacity as the United States to produce large quantities of food and have enough labour to actually harvest it — Canada would need to import UK labourers each harvest season if Canada was supplying 100% of UK food needs. However, it’s only 30.35% of the UK’s total food demand that might need replacing, not 100% of Britain’s total food demand, making it a small problem to substitute EU produce with North American produce. And UK farmers and ranchers are likely to pick up more than half of the 30.35% within one season, leaving less than 15% of the UK’s total food demand for North America to supply to the UK. Such a tiny amount wouldn’t even register as a blip on the financial charts of North American food exporters. A commitment by HM government to political courage may result in a large upside for both the UK and the EU — a true ‘Win-Win’ Brexit deal. This week we talked about EU food exports to the UK and how employing some political courage could help drive the EU to the Brexit negotiating table — without ending Theresa May’s excellent diplomatic efforts (which have so far returned absolutely zero, but it’s still theoretically possible such diplomacy could still yield a positive result) and thereby gain a ‘Win-Win’ Brexit deal. Lowering EU food imports to the UK by 1/5th per month might be just the incentive needed to get the EU to the table. We’ll know within 6-months. Next week, we’ll talk about lowering EU auto imports by 1/5th per month in an attempt to get European Union negotiators to the table to work out a reasonable Brexit deal. Only 221 days to go until the official Brexit date of March 29, 2019, and only microscopic progress has been made on crafting a ‘Win-Win’ divorce deal. Posted on August 21, 2018 August 20, 2018 Author John BrianCategories Brexit, European Union, UKTags 'Hard' Brexit, Brexit, EU, European Union, How Many Days Until Brexit, March 29 2019, official Brexit date, Theresa May, UK1 Comment on As Brexit Negotiations Lag: Are Europeans Missing Opportunities as Big as the Sky?